The sun is shining, the skies are blue - and very quiet I must add, as Britain struggles with the fallout from the Icelandic volcano this week. I'm in a summery mood and have been able to get out into the garden after the looooong winter. I used to be able to buy marinated feta with sun-dried tomatoes, olives and chillies, but haven't seen it on the shelves recently. No matter, this recipe is easy and tastes just as good, if not better. One of the best things you can do with the feta is to stuff it into red peppers and bake them, serve with crusty bread - delish! Pat the feta dry with some paper towels and cut into 2cm cubes. Place in a bowl and sprinkle with the oregano, coriander seeds and black pepper. Drain the sun-dried tomatoes in a bowl and put the oil to one side. 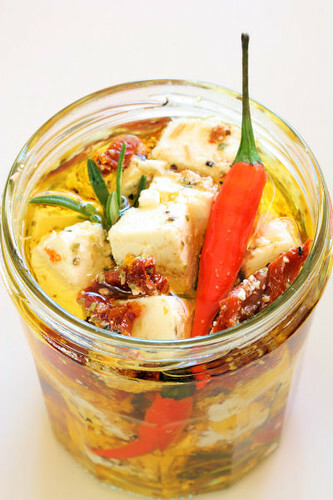 Arrange the feta, chillies, rosemary and sun-dried tomatoes in a 750ml sterilised jar. Cover with the saved tomato oil and top up with extra olive oil if needed. Seal and refrigerate for 1 week before using (it will keep for 6-8 weeks in the fridge). Serve at room temperature. Oooh this is right up my street! 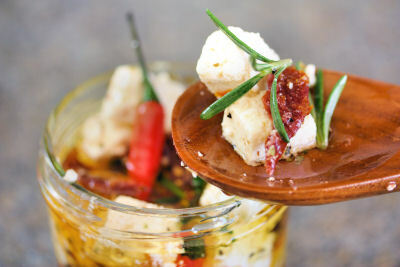 Feta and chillies - yum! Looks so so good, i did last with herbs and chillie flakes and loved it too. Love love marinated feta! And the oil becomes so delicious and flavourful, I love dipping breadsticks into it :) This has beautiful colours and looks perfect as a gift! That looks fabulous as usual Nic. And I'm thinking it would make a great little gift for someone too. Personally I'm not a chilli person, would it matter if I left them out do you think, or do you not get too much heat from them this way? Jan - thanks, I knew it would be! Happy Cook - thank you - chilli flakes is a great idea! Diva - I will try with breadsticks! Thanks! I made a little bit opf this and gave it away Christmas. I had swerved it just thrown into a salad...I like the idea of baking it. The colors are just popping! I will remember this the next time I want to buy some pre-made. i'm not crazy about plain ol' feta, but if it's been soaked in these flavors, methinks its appeal would skyrocket! What a grand idea to marinating your own feta!! Looks very tasty & apart! Right up my cheesy street Nic. Gorgeous pictures and so alive with flavour! Sigh ... now to find a goat, milk it and begin making my own feta!! You are right, I used to see something like this in the supermarket but it seems to have vanished lately. My local turkish store probably does feta in oil but I don't get to go there so easily. You've got me dreaming about summer now! Nic, you've just made me drool! I have done these at home and are truly droolworthy! Dang...gonna have to do this...dh is a nut about marinated feta, and the storebought stuff is insanely overpriced. 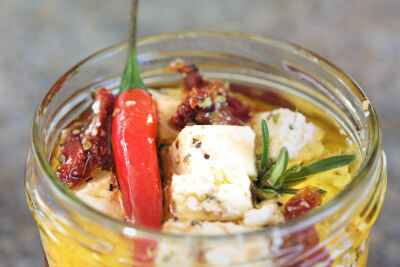 You know I'd never thought about making my own marinated feta! It sounds and looks delicious, I will be definately making this very soon! GOODNESS! I love feta and buying it ready-marinated sometimes means I don't get the flavours I want. This such a great idea. Oh, and your strawberries and cream cake? Send over a slice pleasee! Oh, I love this recipe! We used to buy jars of marinated feta all the time and then stopped and I can't even remember why! This looks so flavorful and delicious. I must do this this summer! What a lovely recipe - I think I might be making this one. I'm another sone for buying feta and then letting it go off in the fridge, so this is great. Oh yum, I'll so be making this soon. When I lived in UK it was easily available. Here in Spain I've only seen it in one supermarket at a costly price of almost 6E far too expensive. Hello! Found your blog through #FF on Twitter. This is so pretty! 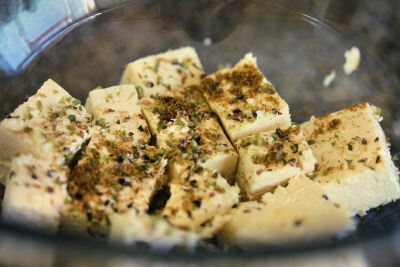 I like marinating cheese for nibbles too - especially homemade yoghurt cheese, it takes up the flavour beautifully.